How does culture affect child-rearing practices? How do factors such as poverty, ethnic difference, racial minority status, and having immigrant parents alter the experience of a growing child? Are there culturally distinct sub-groups within the African-American population? How ubiquitous are psychoanalytically derived schedules of personality development? In what form and to what extent are transference and countertransference affected by such racial, ethnic, and economic issues? In this volume, eight distinguished psychoanalysts (including some belonging to ethnic and racial minorities) attempt to answer these questions. 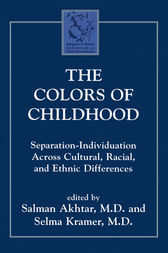 They provide illuminating details of child-rearing practices in African-American, Indian, and Japanese families. They interweave mythological legacies, historical background, ethnographic data, and clinical observations into a rich tapestry of knowledge, empathy, and understanding. They try to tease out the variables of socioeconomic class from the issue of race and the ambiguities consequent upon raising children in a new and unfamiliar land from the ordinary and inevitable conflicts between generations. Salman Akhtar, M.D., is Professor of Psychiatry at Jefferson Medical College, Lecturer on Psychiatry at Harvard Medical School, and Training and Supervising Analyst at the Philadelphia Psychoanalytic Institute. He is the Book Review Editor of the Journal of Applied Psychoanalytic Studies, an associate editor of the Journal of Psychotherapy Practice and Research, member of the editorial board of the Journal of the American Psychoanalytic Association, past member of the editorial board of the International Journal of Psycho-Analysis, and an editorial reader for Psychoanalytic Quarterly. He is the author of Broken Structures: Severe Personality Disorders and Their Treatment (1992) and Quest for Answers: A Primer for Understanding and Treating Severe Personality Disorders (1995). His more than 130 scientific publications also include thirteen edited or co-edited books. Dr. Akhtar is the recipient of the Journal of the American Psychoanalytic Association's Award (1995) and the Margaret Mahler Literature Prize (1996), and was named the 1998 Clinician of the Year by IPTAR, New York. He has also published five volumes of poetry.